Castaway Cay is a private island in the Bahamas owned by Disney Cruise Line. 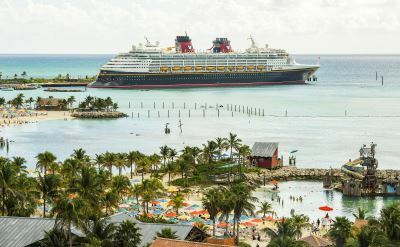 A variety of Disney's Bahamas and Caribbean cruises include a stop at Castaway Cay. Departures are from Port Canaveral (Florida), which is the port closest to Orlando. Ships park at a big dock, which means the ship is conveniently accessible throughout the day. There is transportation around the island, including a tram to Serenity Bay - the beach exclusively reserved for adults. Disney provides this excellent video about a day at Castaway Cay. Castaway Cay is full of ways to play. Rent snorkel gear, water cycles, paddleboats, sea kayaks, or sailboats. Swim with stingrays in a private lagoon. Spray each other with water jets at Spring-A-Leak. Pelican Plunge is an offshore floating platform with water slides and water cannons. 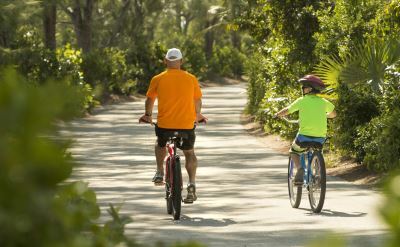 Explore the island with a guide on the Castaway Cay Walking and Kayak Nature Adventure. Or drive a personal watercraft through natural wonders on the Watercraft Ski Adventure. Take a look at this huge album of Castaway Cay photos. 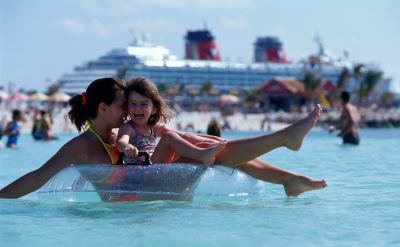 3-night cruises to Castaway Cay on Disney Cruise Line. Round-trip from Port Canaveral to Nassau (Bahamas) and Castaway Cay (Bahamas). • 2019 departures: March 1, 8, 15, 22, 29; April 5, 12, 19, 26; May 3, 10, 17, 24, 31; June 7; July 26; August 2, 9, 16, 23, 30; September 6, 13, 20, 27; October 4, 11, 18, 25; November 1, 8, 15, 22, 29; December 6, 13, 27. 4-night Bahamas cruises on the Disney Cruise Line. Round-trip from Port Canaveral to Nassau (Bahamas) and Castaway Cay (Bahamas). • 2019 departures: March 4, 11, 18, 25; April 1, 8, 15, 22, 29; May 6, 13, 20, 27; June 3, 10, 19; July 3, 17, 29; August 5, 12, 19, 26; September 2, 9, 16, 23, 30; October 7, 14, 21, 28; November 4, 11, 18, 25; December 2, 9, 16, 23, 30. 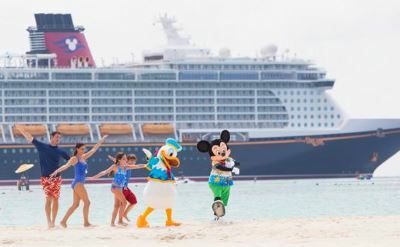 7-night cruises to Castaway Cay on Disney Cruise Line. Round-trip from Port Canaveral to Tortola (British Virgin Islands), St Thomas (US Virgin Islands) and Castaway Cay (Bahamas). • 2019 departures: March 9, 23; April 6, 20; May 4, 18; June 1, 15; July 13; August 10, 24; September 7, 21; October 5; November 2, 16, 30; December 28.